Hey Chris can you tell us where you are in the world right now and what are you up to? Right now I am at the Power Monkey Camp. There are about ninety athletes and thirty coaches in here. The coaches represent a broad range of specialties. Chad Vaughn has just won another Master’s weightlifting title, he is here working and directing the weightlifting side. We have got World Champion gymnast and Olympic athlete Dave Durante who runs one of these sessions as well. I run the endurance section here, and am working in 2 hour blocks. It’s an amazing place and atmosphere, very exciting things happening in here. In regards to endurance, how high is the standard for the top Crossfit athletes, how important is endurance to them and how good do they have to be to win the Games? That’s an interesting question. 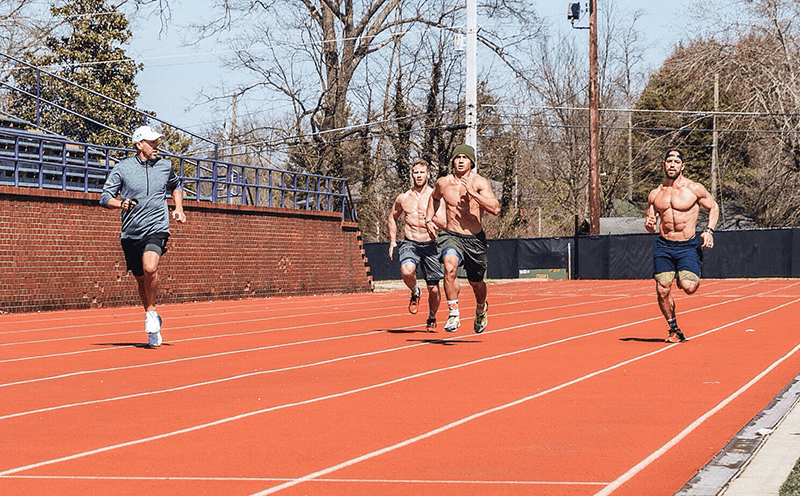 There is no doubt that endurance is a vital part for these athletes and they have evolved their training to properly incorporate endurance work. In 2013, Jason (Khalipa) and I truly worked on and trained his endurance. We saw that this gave him a unique and incredible competitive advantage. He was doing something in 2013 that no other games athletes was doing to the same extent. The secret is working on endurance. 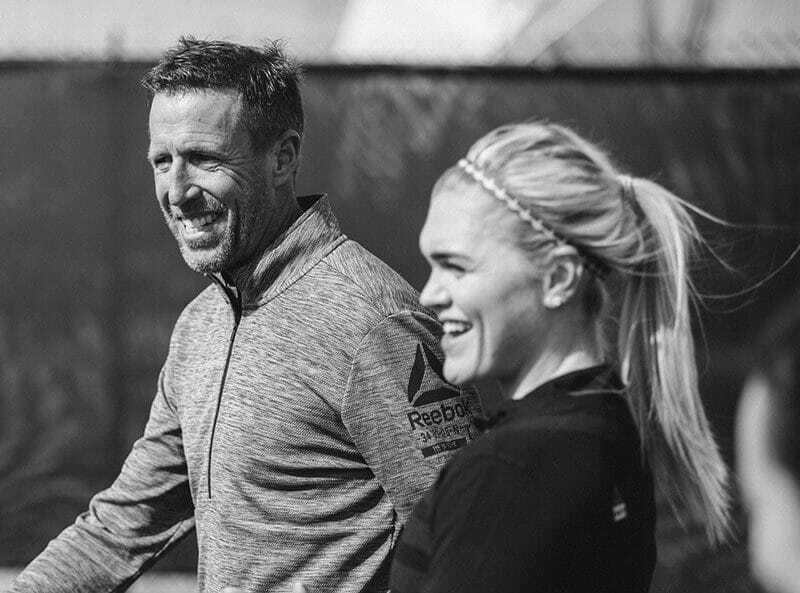 Every single games athlete is now training their capacity endurance to a high standard. How did you and Jason begin working together? Did he have a specific set goal for improving his endurance? I’d been doing Crossfit for a little over 4 years when I got that phone call from Jason. And I had actually been a member in the gym for over a year. He called me on the telephone and said: “Hey Chris, this is J! ”. I had no idea who I was talking to! He asked me to be his coach. And I was like, Oh my god! This is Jason Khalipa! I had butterflies in my stomach and I was so nervous. He said if you accept then I’ll do anything you say without questioning your methods. And again, I was so nervous, but I thought about the knowledge I had and the positive effects Crossfit had had on my endurance training. 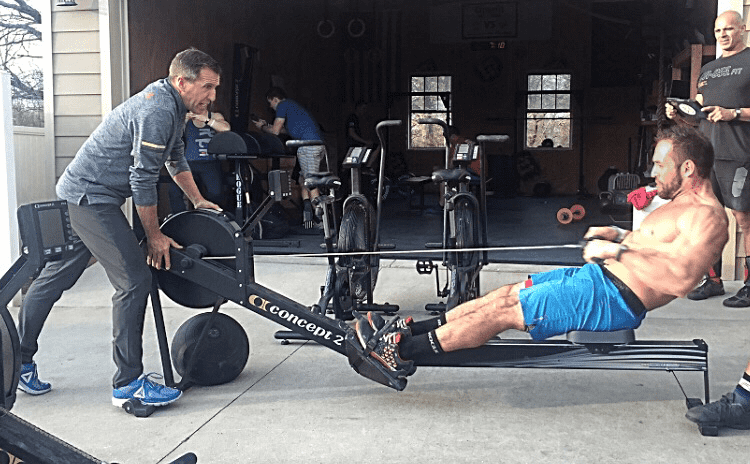 I wondered what would happen if we took a purely crossfit athlete with no endurance background and adapted my endurance training into his program. You once said “I think a coach ultimately is responsible for building confidence”. Can you expand on how you do this with your athletes? So, I do believe our number 1 concern as coaches is to create confidence. When I met with Jason Khalipa for the very first time he was a broken and beat down athlete. You could easily get inside his head. When I put together his programming, I recognised immediately that I needed to build up his knowledge as well in terms of running and other types of endurance activity. But I had to build up his own knowledge about himself and his capability and I wanted to make him a strategic thinker and an even more powerful competitor. Unless I built up this foundation of knowledge, this foundation of experience, he was never going to be a threat. I developed an arsenal of different gears in terms of running for him to use, and trained him to realise the different speeds that I was asking him to do. Over time he began to understand what the workouts meant and how to strategically accomplish them. Do you every see any correlation between an increase in endurance training at the expense of strength? So this was a number 1 concern for me when I first started. But at what risk will extended endurance work impact their power output and strength? From my experience, especially with Games Athletes, this does not have a negative impact, and in many cases the reverse is true as long as the endurance work is done in moderation. He was the one that concerned me the most because here is a very experienced weightlifter, and what if my endurance training had a negative impact effect on his strength and it went down? 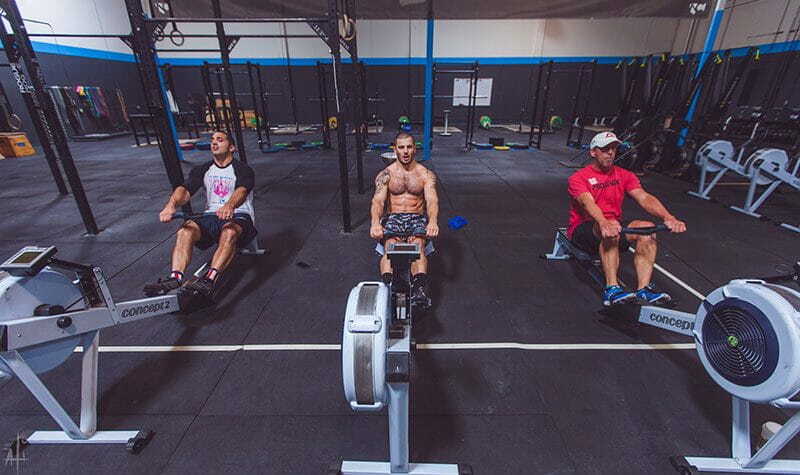 I had this great moment last june, Mat Fraser was doing a workout of mine, it was 3 rounds of 3 x 600m for a total of 5400m. He was running a 6-minute mile pace. Three hours later he hit a 170kg (375 lb) PR in his Clean and Jerk. That to me was super exciting. The key is moderation. 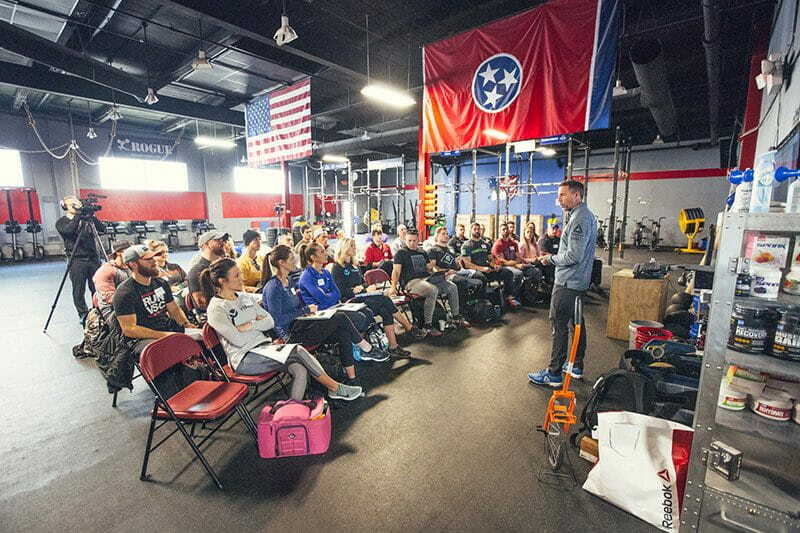 You can’t train a Crossfit athlete like a triathlete and my athletes don’t put in a lot of volume, but what they are doing is targeting muscle groups that are neglected. That’s where I focus my time. In triathlons you train for set distances in different disciplines, how do you train your Crossfit athletes for the unknown? I come from an endurance background. I understand endurance science. I train my athletes very traditionally from what I’ve learned from my career of competing in long distance triathlons. Crossfit is substantially different from that. We are not targeting one specific distance to be good at. We want to be good at a broad range of distances and so we must train and be prepared for exactly that. Its always important to develop an arsenal of gears for your running. I test and work around the following time and distances, which are all important for Crossfitters. 400 m speed in Crossfit is critical! Do you have any kind of tips for everyday Crossfitters that are looking to improve their endurance? Well, on my website Aerobic Capacity I add 3-4 workouts every single week in terms of running. If you have more specific question about it, you can check out my website. This workout has 3 different paces. Your 500m pace must be faster than your mile PR pace but slower than your 400m PR pace PR. Your 100m sprint pace must be equal to or faster than your 400m PR pace. 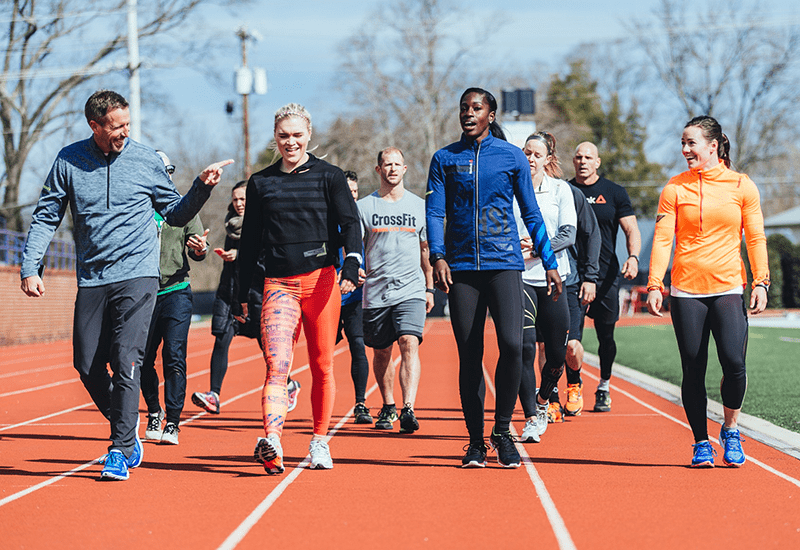 Use your 200m recovery jog in order to hit your 100m pace goal. You work a lot with the top Crossfit athletes. What is it like as a coach to train these individuals? It’s tough. I love coaching, I really do, but it’s incredibly stressful. Expectations are real, they want to see improvements and the thing about running is that you can easily measure your improvements. For more information about Chris Hinshaw and his Aerobic Capacity program, Check out his website or facebook page.